Agios Giorgis Thimena's was built in 1955 on the mount Tsimpes, this chapel can provide the visitor with an excellent panoramic view of the nearby islands as well as Naxos and Amorgos. 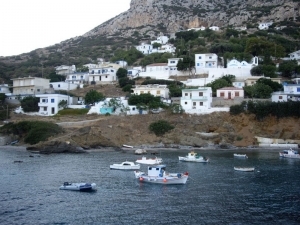 Agios Nectarios and Agios Theologos Thimena's are not far away from the village and they have great view to Patmos island. Agios Demetrius Thimena's is built not long ago at “Psili Ammos” (Golden Sand), in the loving memory of a young soldier killed there. Agios Nicholas Thimena's was built in 1953 on Limionas beach. This church is famous for a festival that takes place there every December on the 6th and which attend the entire village.